Okay, I have made several steaks on the EGG now and the results have been pretty good. Last week, I picked up a cast iron grid at the mothership. Cooked steaks that night and the difference was apparent as soon as I put on the meat. Got the EGG and grid up to about 600. Put on the steaks.... then I heard the sizzle and the EGG started bellowing out smoke. Prior to now, I have had to up the TRex method for searing from 90 seconds to 2.5 minutes per side. This time based on the observations I changed back to the 90 seconds. The results were amazing. These were some of the best steaks that I have ever had including some pretty pricy steakhouses. The problem I now have is: I am planning on getting a Small for traveling and as an extra cooking surface. Can I get a cast iron grate for a small?? To my knowledge there is not one available. I have been on the look out for the past year. It would be awesome to have the cast iron just to cook one or two on the small. Based on the contradicting responses, I checked the BGE site, and EGGTUCKY is right. They do offer the CI for the small. There is nothing keeping me away from getting my small now. Except for the money of course. My wife is gonna kill me. I just checked the BGE site, and it says that they do have one.... SO you might be in luck. Let us know if you get one. BTW, do you like your small? Before BGE started offering them I cut three cast iron grates for small eggs. If you are at all handy and have the tools it's not that hard to do. 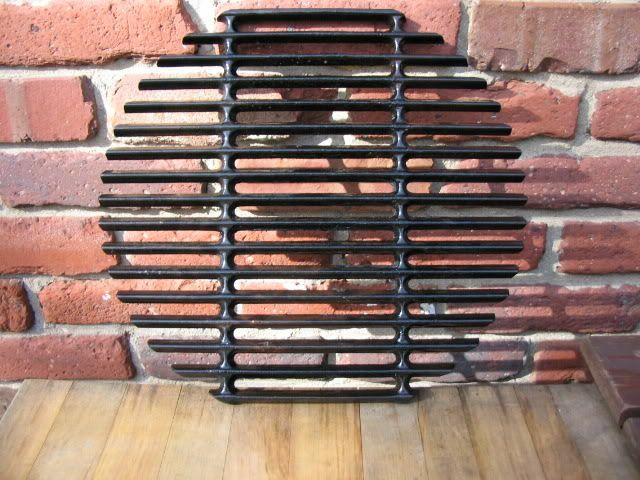 This one came from a Char-Broil 8000 series Cast Iron Grid SKU # 0 47362 89805 from Home Depot. They may have to order it for you, but you can get two grates from it at $15 a piece. Thanks for the feedback.... sounds like a grate idea?? The Weber equipment does not have any detrimental effects on the EGG, does it? No problem. Hopefully, you can get one. cast iron is cast iron...besides I personally believe the un-restricted self made grate is better since it can expand with the intense heat vs the constraining outer circular ring of the BGE one. OTOH with the CI13 being a new product that tells me that it is only available at the Mothership in Hotlanta - just like the new Nomex gasket. You'll probably need a new gasket once you see the wonderful results you get from cast iron at high temps. You might want to order both at the same time to save S & H. Just trying to be helpful. 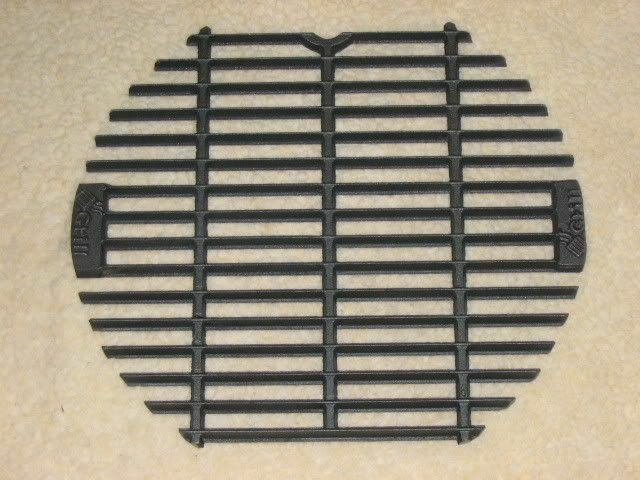 How do you take care of the cast iron grid? Does it rust? I can not and will not speak for whatever BGE sends with their product, but my cast iron that I cut is now 5 years old. At first I cured it like Lodge said to do with their Dutch ovens and it looked beautiful IMO. Very soon thereafter I discovered that high heat on cast iron eliminates that cherished black coat that you want on pots for low temp protection...but when you want sear marks on your burgers, chicken breasts, and steaks you want the HOT cast iron. 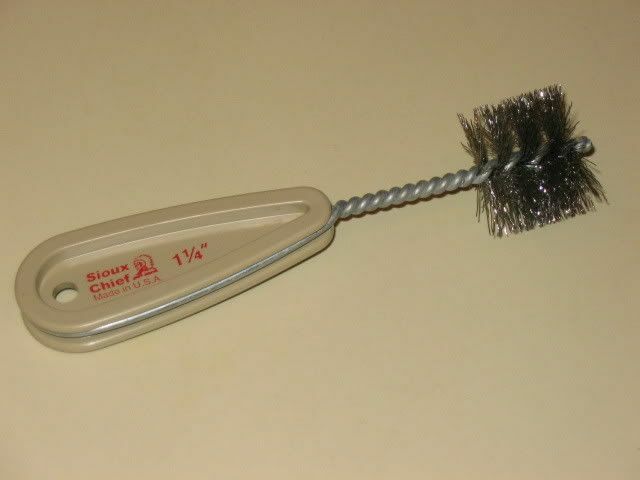 While it may appear to have rust at the outset, the cast iron builds up its own protective coating that withstands a quick cleaning before use by one of these common stainless steel pipe brushes, which are actually quite cheap! Is it ready yet Bobby?